Greater Manchester from Billinge Hill. 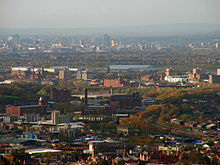 Greater Manchester is heavily urbanised and consists of vast built up areas and many settlements. Greater Manchester is a landlocked county spanning 492.7 sq mi (1,276 km2) (39th largest in England). The Pennines rise along the eastern side of the county, through parts of the boroughs of Oldham, Rochdale and Tameside. The West Pennine Moors, as well as a number of coalfields (mainly sandstones and shales) lie in the west of the county. The rivers Mersey, Irwell and Tame run through the county boundaries, each of which rise in the Pennines. Other rivers run through the county, including the Beal, the Douglas, the Etherow, the Goyt, the Irk, the Medlock and the Roch. Black Chew Head is the highest point of Greater Manchester, rising 542 metres (1,778 ft) above sea-level, within the parish of Saddleworth. Chat Moss at 10.6 square miles (27 km2) comprises the largest area of Grade 1 and 2 farmland in Greater Manchester and contains the largest block of semi-natural woodland in the county. Wardle is the most northerly settlement of Greater Manchester and Ramsden Clough the most northerly point; the suburb of Woodford the most southerly settlement and New Hall Farm (by the River Dean) the most southerly point. Greater Manchester has a strong regional central business district, formed by Manchester City Centre and the adjoining parts of Salford and Trafford. However, Greater Manchester is also a polycentric county with ten metropolitan districts, each of which has a major town centre – and in some cases more than one – and many smaller settlements. Greater Manchester is arguably the most complex urban area in the United Kingdom outside London, and this is reflected in the density of its transport network and the scale of needs for investment to meet the growing and diverse movement demands generated by its development pattern. The following table outlines the county's major settlements, formatted according to metropolitan borough. Black Chew Head is the County Top of Greater Manchester, at 542 metres (1,778 ft) above sea level. The high points of each of Greater Manchester's metropolitan boroughs. The underlying geology of Greater Manchester is dominated by rocks from three main periods from the geologic time scale—Carboniferous, Permian-and-Triassic, and Quaternary. Most of Manchester, and its suburban fringe to the south, is located on Permian sandstones and red Triassic sandstones and mudstones, mantled by thick deposits of till and pockets of sand and gravel deposited by glaciers at the end of the last glacial period, some 15,000 years ago. The oldest rocks, from the Upper Carboniferous period, are sandstones and shales of Millstone Grit present as outcrops and uplands in the north-east of Greater Manchester, such as the upland moors of Dark Peak and South Pennines to the east and northeast of Rochdale, Oldham and Stalybridge. These rocks are overlain by shales, mudstones and thin coals of Coal Measures upon which the towns of Oldham, Rochdale, Bolton and Wigan are located. An outcrop of Coal Measures extends southwards down through Tameside and into Hazel Grove. Starting in October 2002, a relatively large number of earthquakes were recorded in Greater Manchester, some of which were among notable tremours in the British Isles. By the end of November 2002 more than 100 earthquakes had been recorded by the British Geological Survey. The first quake, of magnitude 3.2 on the Richter Scale, struck on Monday 21 October 2002, with an epicentre about 1 mile (1.6 km) east of Manchester Piccadilly station at a depth of 3.4 kilometres (2.1 mi) A second quake of magnitude 3.9 on the Richter Scale followed four hours later and was followed by a further two substantial earthquakes on 22 October 2002. The epicentres were within a region of about 1 kilometre (0.62 mi) in diameter, about 2 kilometres (1.2 mi) northeast of the University of Manchester, leading to the rare classification of "Earthquake swarm" for the geological events. This earthquake swarm was probably caused by the movement of blocks of rocks at depth along faults that occur in the Upper Carboniferous and Triassic succession, underlying the area. Shallow, primitive, and small-scale coal mining from the Upper Carboniferous Coal Measures in what became Greater Manchester started as early as the 13th century. The situation changed dramatically during and after the Industrial Revolution; the construction of the Bridgewater Canal and other canals in the area, enabled coal to be cheaply transported to Manchester and the River Mersey for shipment. In Oldham, relatively shallow pits were dug due to flooding problems. The writer Daniel Defoe, on a visit to Oldham, described it as a place of "... Coals ... upon the top of the highest hills" because the coal seams were so shallow and accessibile. Advances in mining technology during the late-19th century lead to the formation of deeper mines. The Long Depression aside, there was a rapid acceleration of coal mining until about 1920, when the collieries in the eastern part of the Manchester Coalfield were exhausted and closed. In the western part of the coalfield, however, coal mining was continued into the 1960s. Coal mining ceased in north Manchester in the late 1970s. The outer boundary of Greater Manchester, roughly 130 miles (209 km), "passes through or near several areas of natural beauty". To the northwest are the West Pennine Moors, and to the north and northeast the South Pennines. Parts of the Peak District National Park also cover the east and south east of Greater Manchester. The Greater Manchester Urban Area is the larger of two main conurbations defined by the Office for National Statistics that lie within the county boundaries, the other being the Wigan Urban Area. The Greater Manchester Urban Area is an area of land defined by the Office for National Statistics consisting of the large conurbation surrounding and including the City of Manchester. Its territory spans much, but not all of the metropolitan county of Greater Manchester. It excludes settlements such as Wigan, Westhoughton, and Marple from the Greater Manchester county boundaries (Wigan itself forming the Wigan Urban Area), but includes some settlements which are outside of the county boundaries, such as Wilmslow and Alderley Edge in Cheshire, and Whitworth in Lancashire. Greater Manchester experiences a temperate maritime climate, like most of the British Isles, with relatively cool summers and mild winters. The county's average annual rainfall is 806.6 millimetres (31.76 in) compared to the UK average of 1,125.0 millimetres (44.29 in), and its mean rain days are 140.4 per annum, compared to the UK average of 154.4. The mean temperature is slightly above average for the United Kingdom; Greater Manchester also has a relatively high humidity level, which lent itself to the optimised and breakage-free textile manufacturing which took place around the county. Snowfall is not a common sight in the built up areas, due to the urban warming effect. However, the Pennine and Rossendale Forest hills around the eastern and northern edges of the county receive more snow, and roads leading out of the county can be closed due to heavy snowfall, notably the A62 road via Standedge, the A57 (Snake Pass) towards Sheffield, and the M62 over Saddleworth Moor. Contrary to its reputation as an urban sprawl, Greater Manchester has green belt, constraining urban drift, and a "wide and varied range" of wildlife and natural habitat. For instance, the wooded valleys of Bolton, Bury and Stockport, the moorlands north and east of Rochdale, Oldham and Stalybridge, and the reed beds between Wigan and Leigh, harbour flora and fauna of national importance. Mature woodland, scrubland, grassland, high moorland, mossland, agricultural land, lakes, wetlands, river valleys, embankments, urban parks and suburban gardens are habitats found in Greater Manchester which further contribute to biodiversity. The Greater Manchester Ecology Unit classifies Sites of Biological Importance. The 21 Sites of Special Scientific Interest (SSSI) in Greater Manchester, and the 12.1 square miles (31 km2) of common land in Greater Manchester are of particular interest to organisations such as the Greater Manchester Local Record Centre, the Greater Manchester Biodiversity Project and the Manchester Field Club, which are dedicated to wildlife conservation and the preservation of the region's natural history. Among the SSSIs are Astley and Bedford Mosses which form a network of ancient peat bog on the fringe of Chat Moss, which in turn, at 10.6 square miles (27 km2) comprises the largest area of prime farmland in Greater Manchester and contains the largest block of semi-natural woodland in the county. The Wigan Flashes, such as those at Pennington Flash Country Park, are the by-product of coal mining, where subsidence has led to waterbodies collecting in the resulting hollows which form an important reed bed resource in Greater Manchester. Opened in 1979, Sale Water Park is a 152-acre (62 ha) area of countryside and parkland in Sale which includes a 52-acre (21 ha) artificial lake by the River Mersey. Clover, sorrel, nettle and thistle are common, and grow wild in Greater Manchester. Common heather (Calluna vulgaris) dominates the uplands, such as Saddleworth Moor, which lies within the South Pennines and Dark Peak area of the Peak District National Park. The Rochdale Canal harbours Floating Water-plantain (Luronium), an endangered aquatic plant. In 2002, Plantlife International launched its County Flowers campaign, asking members of the public to nominate and vote for a wild flower emblem for their county. 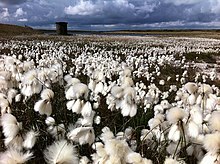 Common cottongrass (Eriophorum angustifolium), a plant with fluffy white plumes native to wet hollows on high moors, was announced as the county flower of Greater Manchester. The grey squirrel was the most common wild mammal seen in Greater Manchester in 2012, and were reported in four out of five gardens; hedgehogs were seen in nearly half of all gardens surveyed; bats were seen in a third of all gardens surveyed. The house sparrow, common starling, and common blackbird are among the most populous bird species in Greater Manchester; almost a third of Greater Manchester's gardens had baby blackbirds in June 2012. Eurasian magpie and feral pigeon are common and breed in habitats across the county. The South Pennines support internationally important numbers of European golden plover, curlew, merlin and twite. ^ a b c Greater Manchester Passenger Transport Authority. "The Greater Manchester Area and its Regional Context". gmltp.co.uk. Archived from the original on 2007-09-27. Retrieved 2007-04-11. ^ Dawson, A., (1992), The Relative Hills of Britain - Chapter 6: The County Tops, Cicerone Press, Milnthorpe, Cumbria. ^ Salford City Council (2007). "Chat Moss". salford.gov.uk. Archived from the original (http) on 2008-09-28. Retrieved 2007-11-13. ^ a b Muir 2011, pp. 201–204. ^ a b c d e f g h i Natural England. "Greater Manchester (including: Wigan, Bolton, Salford, Trafford, Bury, Rochdale, Stockport, Manchester, Tameside and Oldham)". naturalengland.org.uk. Archived from the original on 2012-03-27. Retrieved 2012-09-28. ^ Phythian 1992, p. 4. ^ KS01 Usual resident population Census 2001, Key Statistics for urban areas Office for National Statistics. ^ a b "Manchester Airport 1971–2000 weather averages". Met Office. 2001. Archived from the original on 2007-09-29. Retrieved 2007-07-15. ^ a b "UK 1971–2000 averages". Met Office. 2001. Archived from the original on 2009-07-05. Retrieved 2007-07-15. ^ Met Office (2007). "Annual UK weather averages". Met Office. Archived from the original on 2009-07-05. Retrieved 2007-04-23. ^ "Roads chaos as snow sweeps in Manchester". Manchester Evening News. 2005. Retrieved 2007-07-15. ^ "Snow: West Yorkshire traffic and travel latest". Halifax Courier. Halifax Courier. Retrieved 10 November 2017. ^ "Peak District sightseer's guide – Snake Pass". High Peak. 2002. Retrieved 2007-07-06. ^ "Live: M62 motorway closed and 20 miles of queues as snow and high winds return to Greater Manchester". Manchester Evening News. Manchester Evening News. Retrieved 10 November 2017. ^ a b c d e f Greater Manchester Biodiversity Project. "Greater Manchester Biodiversity". gmbp.org.uk. Retrieved 2012-09-07. ^ a b c Hardy (1998), p. 7. ^ Manchester City Council. "Sites of Biological Importance". wildaboutmanchester.info. Retrieved 2012-09-07. ^ a b Defra (2002). Aitchison, J.W., ed. "The Commonlands of Greater Manchester: A Biological Survey" (PDF). defra.gov.uk. Archived from the original (PDF) on 2012-11-01. Retrieved 2012-09-07. ^ Greater Manchester Local Record Centre. "Welcome to Greater Manchester LRC". gmwildlife.org.uk. Retrieved 2012-09-07. ^ Greater Manchester Bidiversity Project. "What is biodiversity?". gmbp.org.uk. Retrieved 2012-09-07. ^ "Welcome to the Manchester Field Club". webspace.mypostoffice.co.uk. Archived from the original on 2013-06-25. Retrieved 2012-09-07. ^ Salford City Council (2007). "Chat Moss". salford.gov.uk. Archived from the original on 2008-09-28. Retrieved on 13 November 2007. • "Agricultural Land Classification" (PDF). Department for Environment, Food and Rural Affairs. July 2003. Archived from the original (PDF) on 2009-02-25. Retrieved on 12 July 2008. ^ "Appendix J River Mersey Case Study Report". The Countryside Agency. Archived from the original (DOC) on September 27, 2007. Retrieved 2007-04-27. ^ Lashley, Brian (2003-03-20). "So what bloom best suits you?". Manchester Evening News. menmedia.co.uk. Archived from the original on 2013-04-21. Retrieved 2012-09-07. ^ Devon Wildlife Trust. "Species - Cottongrass, common". devonwildlifetrust.org. Archived from the original on 2015-06-26. Retrieved 2012-09-07. ^ Plantlife International. "North-west England". plantlife.org.uk. Archived from the original on 2013-05-01. Retrieved 2012-09-07. ^ RSPB (2012-08-15). "Winners and losers of wet spring revealed". rspb.org.uk. Retrieved 2012-09-30. ^ a b Holland, Spence & Sutton (1984), pp. 28–29. ^ RSPB (2012-05-22). "Make your Nature Count arrives in Greater Manchester". rspb.org.uk. Retrieved 2012-09-30. Phythian, Graham (1992). The Greater Manchester Boundary Walk. Sigma Press. ISBN 1-85058-284-X. Hardy, Peter B. (1998). Butterflies of Greater Manchester. Sale, Greater Manchester: PGL Enterprises. ISBN 0-9532374-0-0. Holland, Philip; Spence, Ian; Sutton, Trevor (1984). Breeding Birds in Greater Manchester. Middleton, Greater Manchester: Manchester Ornithological Society. ISBN 978-0-9509505-0-1. Muir, Jonny (2011). The UK's County Tops: Reaching the top of 91 historic counties. Cicerone Press. ISBN 978-1-84965-553-8.